Just how important are garden hand tools? Well, you wouldn’t have much of a garden without them. Hand planting tools constitute the backbone of all gardening… they always have and always will. Unless you are planting and cultivating acres of ground, you will use gardening tools almost exclusively. Where Are Tools For Planting Used? Your annual border, perennial border, rose border, small vegetable garden, coldframe, trees, shrubs, foundation planting, even your small lawn area will be planted and many times maintained with small gardening hand tools. In fact, we can say that all gardening starts with operations performed with hand garden tools like a spading fork. So it is extremely important to know which ones to use at the proper time and how to use them to get the most work done with the least effort. Let’s start right out at the beginning with planting tools. We have already pointed out, how important it is to get plants off to the right start; now let’s consider how to do it. Spading is the term used for turning over a whole bed or area. This expression comes from the fact that the spade is usually the tool for the job. In a majority of the cases it is, but there are times when the spading fork works best. Pushing a spade into stony soil or ground covered with a green crop is a tough job. In these cases the garden fork is the tool to use. The job of spading is usually finished off by raking to remove stones and break up rough clods. We have to consider holes for some of the larger plants like trees and shrubs. There are occasions, however, on which the entire bed will need to be spaded for large plants. Examples of this would be complete rose borders or a foundation planting which is being put in in its entirety. For trees, however, a hole is always needed. The spade and shovel are the tools used here. Take a little extra time and dig the hole to the proper depth and diameter, even if the ground is hard and the digging a little tough. If the soil is hard for you to dig, think of what the plant roots will have to push through if it isn’t broken up by you. When it comes to cultivating tools, it would be safe to say that the average gardener owns more of these in a wider variety of shapes and styles than any other garden tool. The proper way to use them is sometimes quite confusing. 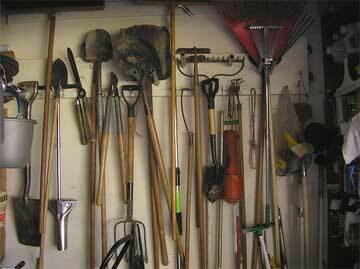 Take hoes, for instance, there are several garden hoe types. We have pictured the standard floral hoe, a pointed warren hoe and a scuffle hoe. There are many other types, of course. It’s helpful when purchasing to known the names of the tools so you’ll come home with the correct one. The floral hoe cuts into the soil quite deeply. Naturally you wouldn’t want to use this hoe on very shallow-rooted crop plants. The warren hoe can get between small plants much easier than the broader bladed hoe. The scuffle hoe, which is pushed back and forth just under the surface of the soil, is for very shallow cultivating and is best used on plants which have roots very close to the surface of the ground. Pronged cultivators are also quite varied in shape and design. We show two long-handled pronged cultivators. The first is the favorite potato hook, which was originally used for hooking mature potatoes out of the ground. It is now used more for cultivating, in a chopping manner similar to that used with a hoe. The other is a large cultivator with adjustable teeth, similar to those found on two-wheel tractors. One pulls this type of cultivator through the ground while walking backwards. The other tools in planting that play important roles cultivating as well are the ones with short handles. We show only three as examples. First is the trowel which comes in several widths for planting small or large plants. The next planting tool is the dibble (or dibber). This resembles an old pirate pistol and should be kept out of reach of small boys if you intend to keep it. This tool provides the holes for seedlings and very small plants. It has a metal tip which is easily pushed into the soil. Hand cultivators are musts in every tool collection. : The wire pronged type is most common, but others are available. This is the cultivator used in coldframes and for close work in the annual and perennial border. True, these are “hands-and-knees tools,” but many times this is the only way to get weeding out. Yes, hand tools are elementary, but shouldn’t be ignored. Proper garden tools properly cared for are as important in the garden as anywhere else. The number of gardening tools can vary with the individual, but as a general rule it is better to have too few than too many. While your collection of “tools for gardening” need not be extensive, it must be carefully selected. Well-made tools will do a superior job to begin with, plus last longer. Countless gadgets designed to take all the work (and incidentally part of the fun) out of working in the landscape or garden are sometimes quite tempting. But remember, it takes more time and effort to keep them in working order than the simple but dependable tools. Proper care and cleaning will insure long life for your landscape and planting tools. Keep on old rag handy to wipe them off as soon as they have done their job, since soil is easier to remove before it dries and cakes. Clean tools make gardening easier, as anyone who has tried to dig with a dirt-caked spade can testify. Before hanging your tools up for the winter, be sure to rub them with an oily rag to prevent rusting. A good example of the results of proper care can be found in the children’s gardens at the Brooklyn, N.Y., Botanic Garden. One of the duties taught and emphasized is the cleaning of tools each time they are used. Some of these gardening tools are still in use after decades of use. The children learned young to respect them and treat them right, a habit which will go with these young gardeners all their lives. Spading Fork – With this invaluable tool a good gardener can dig, break down the soil, level and rake up rubbish. It has four flat prongs and a handle of medium length. All-Purpose Hoe – Useful for cultivating among larger plants, but care must be taken that it does not cut into the plants. Hand Cultivator– Four curved prongs and a long handle make this tool easier and safer for the inexperienced gardener, particularly for smaller plants and newly set-out seedlings. All Purpose Trowel – Another essential cultivating tool – used for digging up small plants, making holes to set them out in, planting bulbs, etc. – the trowel must be strong. Rakes – Iron rake, one of the most common weeding tools is needed for stones and weeds in beds and on walks. A grass rake only should be used on lawns. Shovel – I specially like a narrow, pointed shovel, for digging big holes for shrubs and larger plants. If the edge is kept sharp the shovel can be as useful as the spading fork. Shears – Grass shears for trimming the edges of flower borders and around trees and shrubs, hedging shears for training and shaping hedges, and pruning shears for roses, shrubs and dead branches are musts. A small pruning saw for branches a shear cannot handle rounds out the “manicuring” tools. Watering Can – Even if you normally water with a hose, the watering can is necessary when setting out small plants. Wheelbarrow – Actually any small, wheeled cart will do for picking up weeds and rubbish. And here is a helpful hint: Keep a bushel basket handy in which you can deposit weeds and rubbish as you work. This eliminates the need for backtracking later on. Lawn Mower – The choice is varied and up to you. But whether power driven or pushed your mower must be kept clean, oiled and sharp. With these 10 basic tools you are set for years of happy gardening. Trellis Plants: What Are 10 Of The Best Flowering Vines?